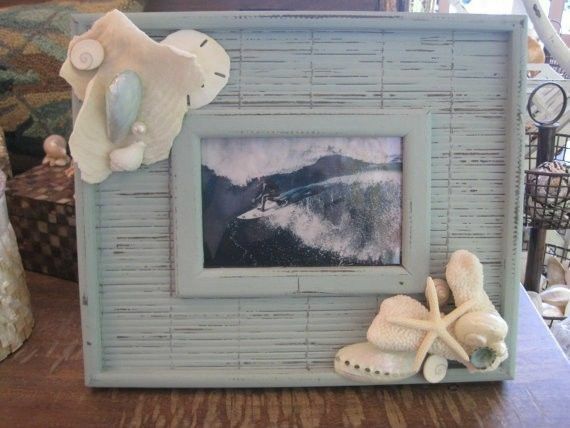 What a pretty beach frame to hold a favorite picture from a vacation or day at the beach! Crafted from wood with a distressed bamboo motif, this soft blue shell frame is 12 1/2″ x 10 1/2″ and holds a 4×6 photo. I put a gathering of pretty shells and coral in two top and bottom corners: a piece of gorgeous Merulina Coral and Finger Coral as focal points, along with a sand dollar, Shiva shells, white Conch, a dyed blue Clam, white Abalone, a Pong shell, pearlized Turbo, a white starfish, Limpet shell, and some pearls for an accent.